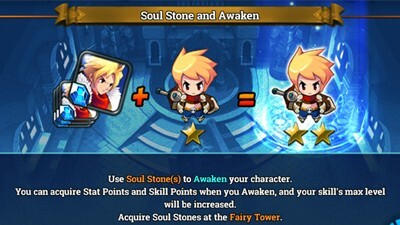 Awakening is a feature in the game that will enhance the stats and skills of your characters by using Souls Stones. To check your awakening status, go to your Item section and click the [Awaken] button. - It is used to awaken and upgrade your characters, making them stronger. - Used to upgrade Avatars for free instead of ZEN. How To Get More Soul Stones? - Fairy Tower can be entered starting Lvl 10. - Consumes Battle Stamina, and increases as you go higher. - HP and MP will carry over to the next Floors until the Section is complete. - Soul Stone drops are random, by class and number of pieces. - Still AI and lasts for 30 seconds, better use on final stage floors to help defeat the Bosses. - If your character can't take damages well, better summon Fighters and Slashers, they will help you tank mobs and bosses. - If your character is a tank, and you want to quickly finish things up, add players using high DPS characters like Magicians, Assassins, and Rangers (Fighters or Slashers are ok too). - Performance of your summoned friend depends on their Lvl and overall items and stats. Try to get high level players as your friend if you can, for BOSS fights. - This is really really helpful, especially for range characters! - More Soul Stones can be obtained as you unlock higher Sections, but just play on the highest Section you can complete to farm Soul Stones for you character. Do not hit the "Stop" option, you will not get any Soul Stones if you do. - Resets after the end of season (7 Days). - You can transfer Soul Stones between characters using the Storage. - If you just need a number of pieces to finally upgrade your character to the next Grade or Star, then it's ok to buy some Soul Stones from other characters (after transferring). - Do not overdo it though, make sure you have enough Gold for other things, especially early game where Gold gain is somewhat low. - From various mission rewards, and in-game events. 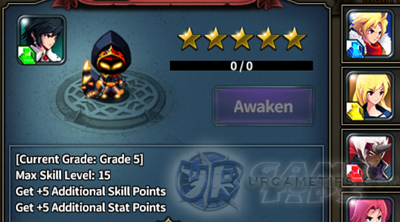 As you can see, upgrading your character via the Awakening feature will increase the level caps of your skills, although you will be given 5 Skill Points per upgrade, it is still recommended that you save your other Skill Points to max important skills every time you unlock a new Awakening Grade.